Congratulations to our Confirmation students on completing their first year of classes! 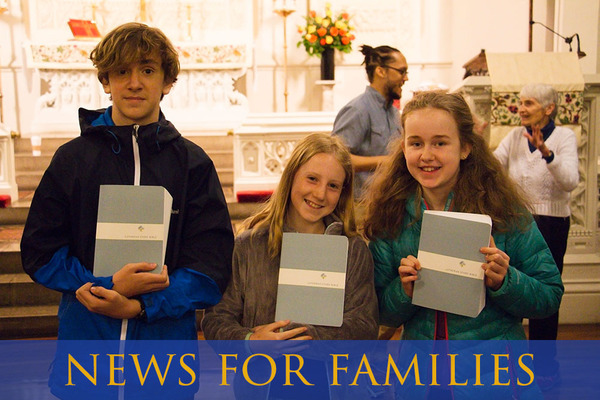 They helped lead worship on Sunday, and received these study Bibles in anticipation of their second year of Confirmation which will focus on the Bible. How big is God’s house? Human knowledge teaches us that every house is only so big, and only has a certain number of rooms. One of the lessons that Jesus taught us is that God’s house is not limited by anything – it is big enough for every person who ever lived. What does that teach us about God’s mercy, forgiveness, and abundance? Check out Sunday school this week, where we will learn about what God’s Grace has to teach us, and all people, about Love. Our last Youth Night of the school year is Sunday, May 21 from 6-8pm in the youth room. All high school and confirmed youth are invited to join us for conversation, snacks, and special fun activities to close out the year!